A few of the interesting and useful hobby electronic circuit diagrams already published in this blog have been selected and compiled here for quick reference and understanding. This is an old trick I learned many years ago. Removing the round metal cap from a power transistor, in many cases, will reveal a photocell. Even those that don't reveal a photocell have a base-emitter region that is sensitive to light when the cover is removed. As shown in the photo, the metal cap has been removed and the photocell is located acroos the base-emitter pins. This particular power transistor read 1250 ohms in darkness and 600 ohms under a light bulb. I removed the cap on a 2N456A and it does not show a photocell inside. In darknesss, it reads 300 ohms. Under a light bulb, it reads 25 ohms. Removing the cover can be difficult. The best way is to use a dremel tool with a metal cutting disc. A small hack saw could also be used. A last resort would be to take a small pair of sharp edge diagonal cutting pliers and pinch the metal at the round edges until the metal is penetrated. Grab as much metal as possible and twist the pliers and metal upwards to expose the inside. Be careful not to damage the base-emmitter region. The amount of resistance change,is going to vary with different types of power transistors. When you need a small size capacitor in an emergency, this is one method of making one. I made a 22 pf (.022nf) capacitor with pencil and paper as shown in the photo below. You need a clean sheet of white paper, such as a typing sheet. You will also need a graphite pencil with a dull end and some scissors. As the size shown resulted in 22pf of capacitance, you will need a smaller size for smaller pf's and larger for larger pf's. Your actual capacitance values will depend upon the type of lead pencil you used and the pressure you applied to the paper sheet. Start on one side and take the side of the pencil lead, making strokes to spread the graphite across the plate area and connection tab on one side. The connector tabs should only have graphite applied on it's plate side. Turn the paper over and do the same thing on the opposite side. The connector tab on the opposite side will be on the opposite end as compared with the front plate. Use a capacitance meter to test the capicatance. If it is a smaller value than what you needed, just add more graphite to enlarge the plate area on both sides. If your tester doesn't identify any capacitance, check with an ohmmeter for a high resistance short. You may have penetrated the paper and shorted the plates. Once you have the value required, take the scissors and allow some space from the graphite plates so you want be cutting into the graphite. Connect pg (gator) type clips to the connector tabs and install it in your circuit. This is only a temporary fix as the environment, moisture, etc., could gradually change the value. We all know about this little versatile chip which finds its way in almost all useful electronic circuits, yes our very own IC 555. The following circuit is no exception, it's a sensitive touch switch circuit using the IC 555. Here the IC is configured as an monostable multivibrator, in this mode the IC activates its output momentarily by producing a logic high in response to a trigger at its input pin#2. The momentary activation time period of the output depends on the value of C1 and the setting of VR1. When the touch switch is touched pin#2 is pulled to a lower logic potential which may be less than 1/3 of Vcc. This instantly reverts the output situation from low to high activating the connected relay driver stage. This in turn switches ON the load attached with the relay contacts but only for the time until C1 gets fully discharged. The circuit of a simple triac light dimmer shown below can be used for dimming incandescent lamps directly from AC mains. The circuit is very easy to construct and uses very few components. The pot is used for controlling the load power or the intensity of the light. The dimmer circuit can be also used for controlling ceiling fan speeds. The circuit illustrated here is probably the simplest form of an audio power amplifier. Though the circuit is very crude by its specs yetis able to amplify an audio input up to a powerful 4 watts in a 8 Ohm speaker. The transistor used in this amplifier is a 2N3055 is used as a switch for inducing voltages in response to the input signals into one half winding of the transformer. The back emf generated across the winding of the transformer is effectively dumped over the speaker generating the required amplifications. The transistor needs to be mounted on a suitable heatsink. Just a couple of transistors are enough for implementing a simple water level alarm circuit and used for getting a warning signal when the water level inside a tank nears the overflowing level. The two transistors are configured as a high gain, high sensitive switch, which also is capable of generating a tone when the shown terminals get bridged through the terminals coming in contact with the water inside the tank. The water offers just about the right resistance value across the specified points of the circuit for initiating high pitched tone or the desired warning alarm. 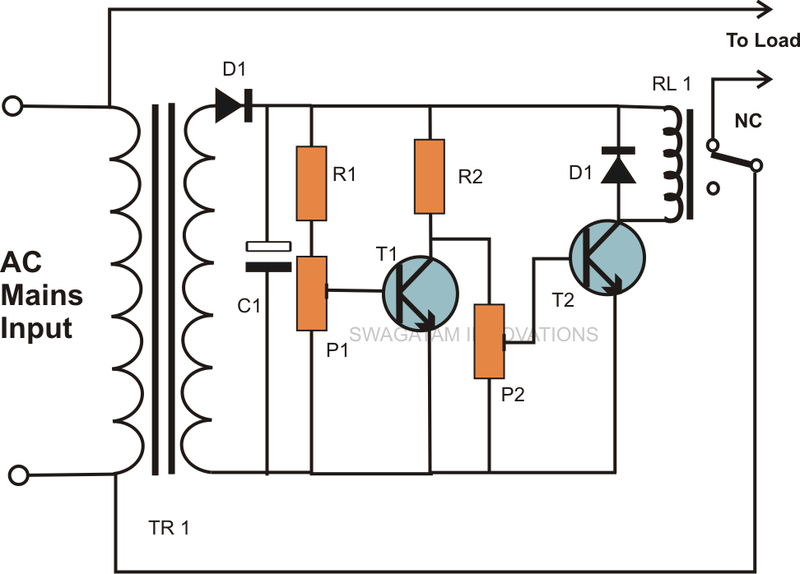 A very simple temperature indicator circuit can be built using the circuit shown in the diagram. A generally purpose small signal transistor is used here as the sensor and another active device in the form of a1N4148 diode is used for providing a reference level to the sensing operation. The heat source which is to be measured is place in contact with the transistor while the diode is held at a relatively constant ambient temperature level. As per the setting of the preset P1, if the threshold is crossed by the introduced heat source, the transistor begins to conduct substantially, illuminating the LED and indicating the generation the heat beyond a particular set limit. Inverters are devices which have important applications where normal electric supply is not available or difficult to obtain through conventional routes. 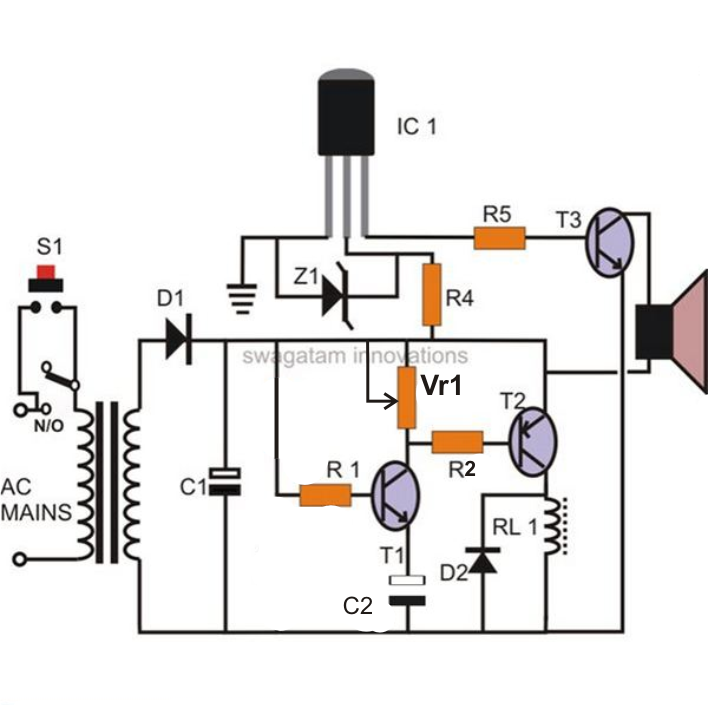 The simple 100 watt inverter circuit shown here can be built and used for powering many electrical appliances like, lights, soldering iron, heater, fan etc. The whole 100 watt inverter circuit mainly involves transistors and therefore becomes easier to construct and implement. This circuit of a transistor power amplifier is outstanding with its performance and is able to provide a thumping 100 watts of pure music output. As can be seen in the diagram it utilizes mainly transistors for making the amplifier and its implementations and a handful of other inexpensive passive components like resistors and capacitors. The required input is not more than 1 V, which gets amplified 200,000 times at the output. 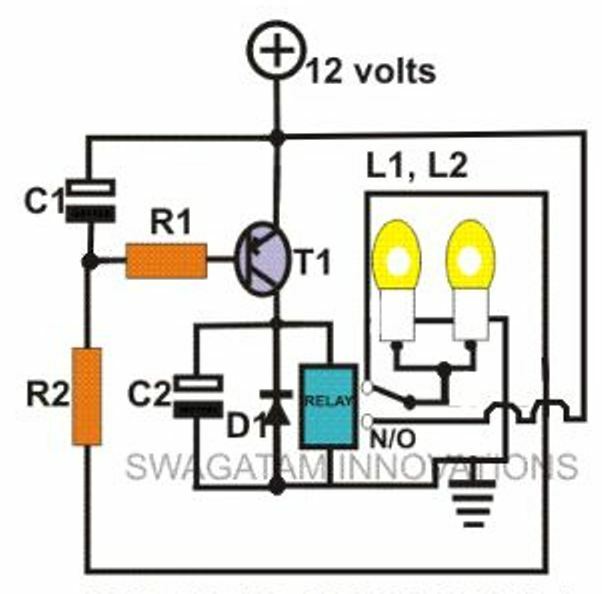 This simple emergency lamp circuit uses very components and yet is able to provide some useful service. The shown device is able to switch ON automatically when mains power fails, illuminating all the connected LEDs.As soon as power is restored, the LEDs shut off automatically and the connected starts charging through the built in power supply. The emergency light circuit employs a transformerless power supply for initiating the explained automatic actions and also for trickle charging the connected battery. LEDs = white, high bright type. 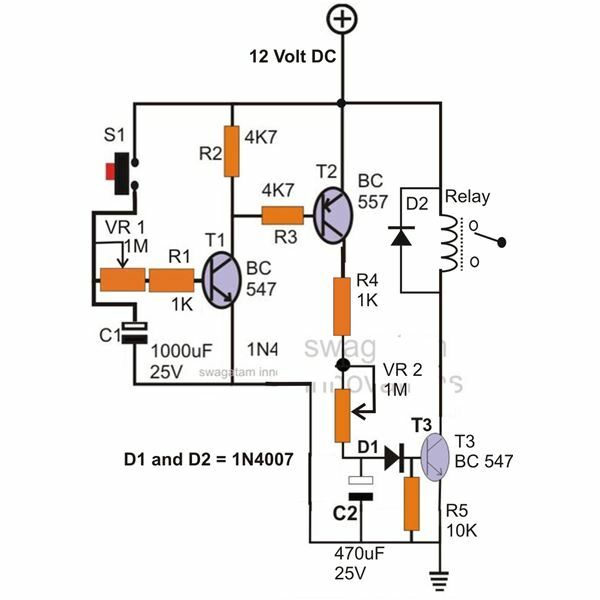 This simple transistor circuit can be used for monitoring the dawn and dusk conditions and for switching lights in response to the varying conditions. Thus the day night light switch circuit can be used for switching ON the connected lights when night sets in and switch it OFF during day break. The threshold tripping point may be set by adjusting the 10K preset. The capacitors are 100uF/25V, the transistors are ordinaryBC547, and the diodes are 1N4007. This is a simple hobby project and exhibits all the properties of a conventional wax type candle. Here the LED is used in place of the candle flame, which illuminates as soon as the mains power fails and shuts off automatically when the power is restored. So it also performs the function of an emergency lamp. The connected battery is used for powering the candle”light and it is charged continuously when the unit is not being used and powered through the mains supply. An interesting “puff off” feature is also included so tatthe “candle” light may be switched OFF whenever desired through a puff of airinto the attached mic which acts as the air vibration sensor. This circuit may be used as an automatic emergency lamp when there’s no power or when mains power fails during night times. 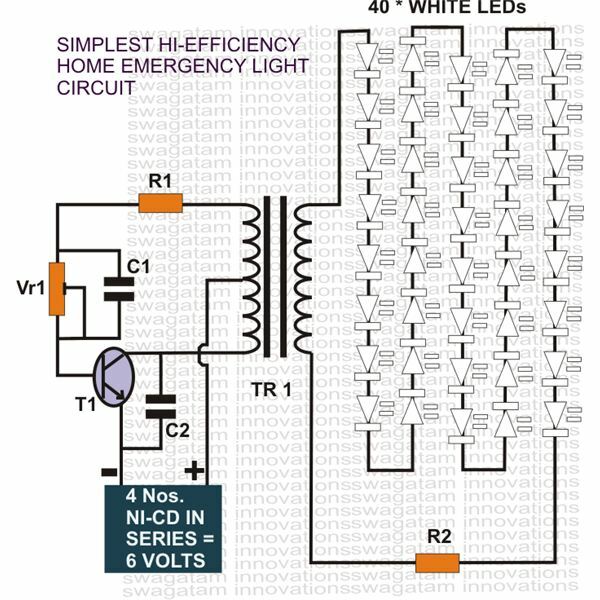 As shown in the diagram, the circuit utilizes a cheap incandescent flashlight bulb for the required illumination. As long as the input supply from the mains transformer is present the transistor remains switched OFF and so does the lamp. However the moment the mains power fails, the transistor conducts and switches ON the battery power to the bulb, instantly illuminating it brightly. The battery is trickle charged for so long as the mainspower remains connected to the circuit. Lamp = 3V flashlight bulb. This circuit may be used for transforming music into dancing light patterns. The operation of the music lamp circuit is very simple, the music input is fed to the bases of the shown transistor array, each of them are configured to conduct at a specific voltage level in the incrementing order from the top to the bottom transistor. Thus the uppermost transistor conducts with the input music is at the minimum volume level and the subsequent transistor starts to conduct in sequence as per the volume or the pitch of the music. Each transistor is rigged with individual lamps which light up in response to the music levels in a “chasing” dancing light pattern. The input capacitor = 0.22uF/25V non polar. The interesting clap switch circuit shown here can be used in stairways and passages for illuminating the premise momentarily through clap sound. The circuit is basically a sound sensor circuit with an enclosed amplifier stage. The clap sound or any similar sound is detected by the mic and converted into minute electrical pulses. These electrical pulses are suitably amplified by the subsequent transistor stage. The Darlington stage shown at the output is the timer stage which switches in response to the above sound interaction and illuminate the connected LEDs for some period of time defined by the 220K resistor and the two39 K resistors. After the time lapses the LEDs are switched off automatically and the clap switch circuit returns to its original state until the next clap sound is detected. The parts list is given in the circuit diagram itself. The circuit shown here can be used for detecting earth leakage conditions and for implementing the required shutting off the mains power supply. Unlike usual configurations, here the ground to the ELCB circuit and the relay is acquired from the earthing line itself. Also since the input coil is also referenced to the common earthing ground, the entire functioning becomes compatible and accurate. On sensing a possible current leakage at the input, the transistors come into action and switch the relays appropriately. The two relay have their individual specific roles to play. One relay detects and switches OFF when there’s current leakage through an appliances body, while the other relay is wired up to sense the presence of a the earthing line and switches OFF the mains as soon a wrong or weak earthing line is detected. A very simple LED flasher circuit is illustrated in the diagram. The transistors and the corresponding parts are connected in the standard astable multivibrator mode, which forces the circuit to oscillate the moment power is applied. The LEDs connected at the collector of the transistors start flashing alternately in wig wag manner. The LEDs shown in the diagram are connected in series and parallel, so that many numbers of LEDs can be accommodated in the configuration. The pots P1 and P2 may be adjusted for getting different interesting flashing patterns with the LEDs. LEDs are 5mm type, color as per choice. 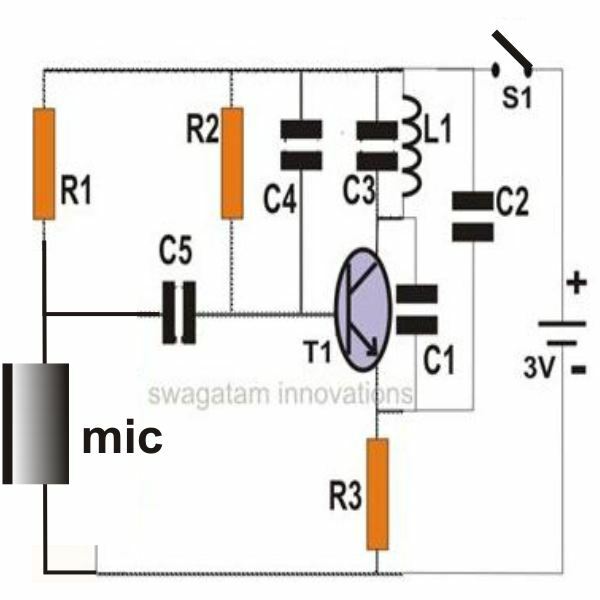 Anything spoken into the mic of the presented circuit cab be clearly picked up and reproduced by any standard FM radio, within a range of 30meters of distance. The circuit is very simple and just requires ther shown components to be assembled and connected with each other as depicted in the diagram. The coil L1 for this FM transmitter circuit consists of 5 turns of 1mm super enameled copper wire, having a diameter of around 0.6 cm. 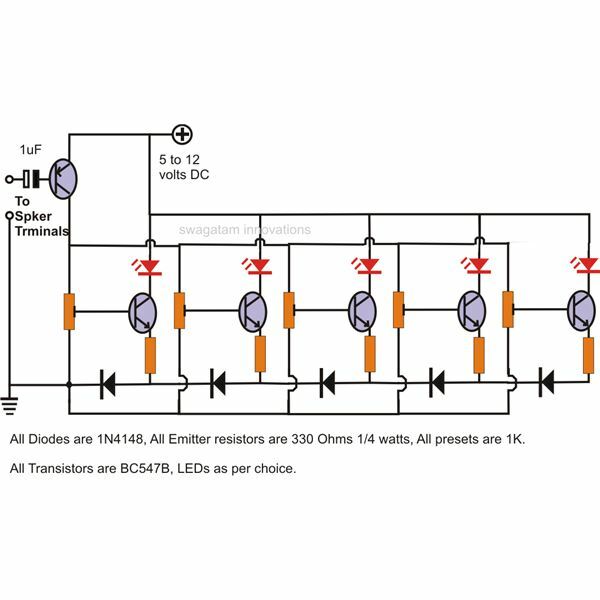 The shown design of a 40 LED emergency light is driven usingan ordinary transistor/transformer inverter circuit. The transistor and the respective winding of th transformer are configured as a high frequency oscillator stage. The oscillations induce a high voltage across the winding of the transformer. The stepped-up voltage at the output is directly used to drive the LED which are all connected in series for getting the desired balance and the illumination. LEDs = high bright white, 40 nos. 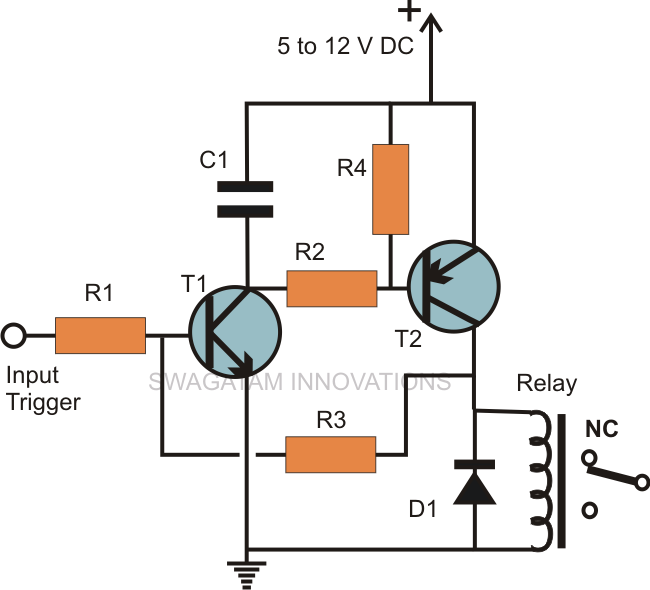 If you are looking for a circuit which can be used to latch the output in response to an input signal, then this circuit can be used for the intended purpose very effectively and also very cheaply. A momentary input trigger is applied to the base of T1,which switches it for a fraction of a second depending upon the length of the applied signal. The conduction of T1 immediately switches T2 and the connected relay. However at the very instant a feedback voltage also appears at the base of T1 via R3 from the collector of T2. This feed back voltage instantly latches the circuit and keeps the relay activated even after the trigger from the input is removed. In one of the previous sections we studied a simple music light show circuit using mains operated incandescent lamps, the present design incorporate LEDs for similar intended light show generation. As can be seen in the figure, the transistors are all wired up in sequencing array. The music signal varying with pitch and amplitude is applied at the base of the buffer amplifier PNP transistor. The amplified music is then fed across the whole array where the respective transistor receive the inputs with incrementing pitch or the volume levels and go on switching in the corresponding manner from start to finish, producing an interesting LED light sequencing pattern. This light exactly varies its length according to the pitch or the volume of the fed music signal. Parts list is provided in the diagram. If you want to make a flasher unit for you motorbike then this circuit is just for you. 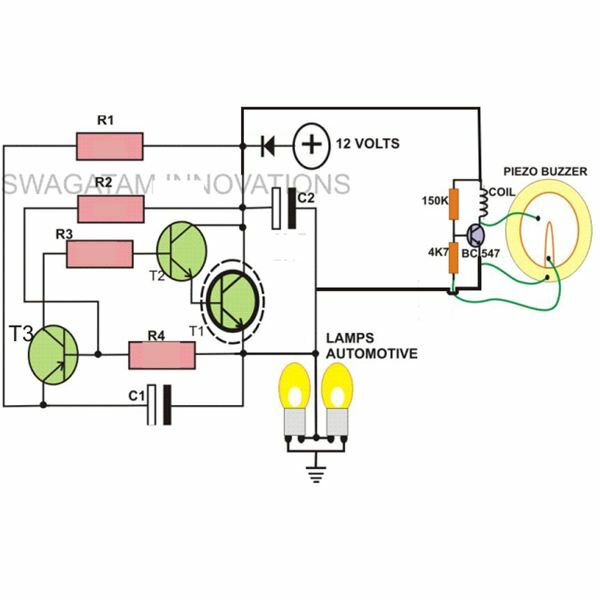 This simple turn signal flasher circuit can be easily built and installed in any two wheelers for the desired actions. The automobile flasher circuit employs just two 2-pins instead of 3 as found in other flasher circuits. Once installed, the circuit will faithfully flash the side indicator lights whenever the intended function is switched ON. The circuit also incorporates an optional buzzer circuit which can be also included for getting a beeping sound in response to the flashing of the lamps. In the above section we discussed a simple three transistor based flasher circuit; here we study another similar design, however here we incorporate a relay for the switching actions of the lamps. The circuit looks pretty straightforward and employs hardly anything substantial and yet performs the expected functions wonderfully well. 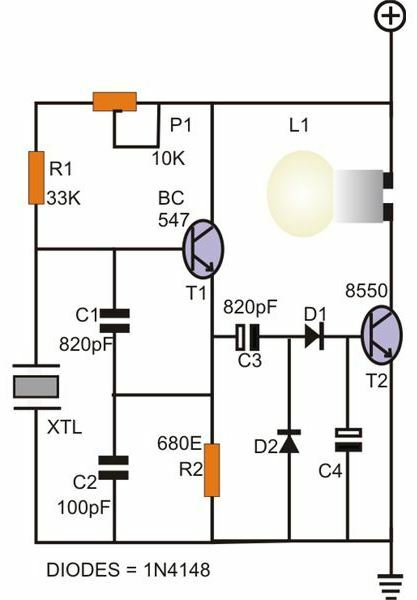 Yes this simple transistor circuit can be used as a home door bell and it’s ON time can be set as preferred by the user, meaning if you wanted that the sound of the bell to remain switched ON for a particular period of time, you could easily do it just by adjusting the given pot. The actual tune is derived from the IC UM66 and the associated components, while all the included transistors along with the relay are configured for producing the time delay for keeping the music switched ON. 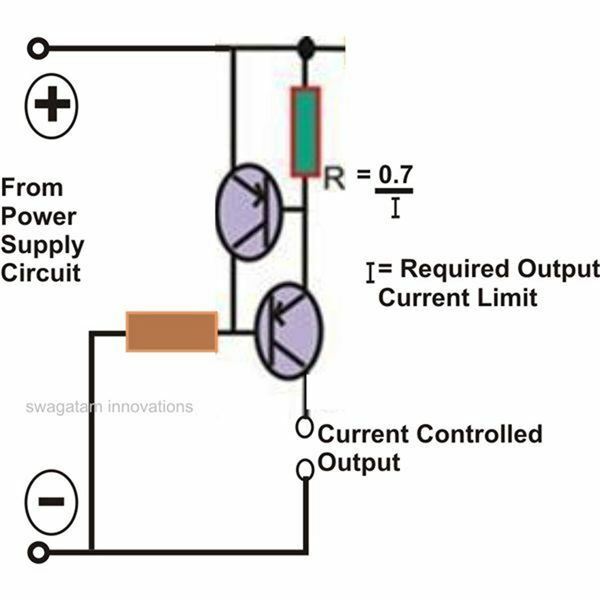 The circuit can be used for generating delays at a desired rate. The On time of the relay can be controlled by adjusting the Pot VR1 while the pot VR2 may be used to decide after how long the relay responds once theinput trigger is fed by the switch S1. The parts list is enclosed inside the diagram. Are you having problems with your input Mains supply? That’s common problem associated with our input mains AC line, where a high and a low voltage conditions are quite frequently encountered by us. The simple high low voltage controller circuit shown here can be built and installed in you house electrical board for getting a 24/7 safety from the possible dangerous AC voltage conditions. The circuit keeps the relay and the wired appliances as long as the mains input stays within a safe tolerable level and switches the load OFF the moment a dangerous or unfavorable voltage condition is sensed by the circuit. This unique work bench circuit utilizes only a few inexpensive transistors and yet delivers some truly useful features. The feature includes continuously variable voltage from zero to the maximum transformer voltage and current variable from zero to the maximum applied input level. The output of this power supply is also over load protected. The pot P1 is used for setting the maximum current while the pot P2 is used for varying the output voltage level up to the desired levels. R4 = Evaluate using Ohms law. When it comes to frequency generating circuits or rather precise oscillator circuits, crystals become a crucial part, especially because they play an important role for generating and maintaining accurate frequency rates of the particular circuit. However these devices are prone to many defects and are normally difficult to check through conventional DMM units. The shown circuit can be used for checking all types of crystals instantly. The circuit itself is a small transistor oscillator circuit which starts oscillating when a good crystal is introduced across the indicated points in the circuit. If the crystal is a good one, the bulb lights up showing the relevant results and if there’s any defect in the attached crystal, the bulb remains switched OFF. In many critical applications, circuits are required to maintain a strict controlled magnitude of current through them of at their outputs. The proposed circuit is exactly meant for carrying out the discussed function. The lower transistor is the main output transistor which operates the output vulnerable load and by itself is unable to control the current through it. The introduction of the upper transistor makes it sure that the base of the lower transistor is allowed to conduct as long as the current output is within the specified limits. In case the current tends to cross the limits, the upper transistor conducts and switches OFF the lower transistor inhibiting any further passage of the exceeded current limit. The threshold current may be fixed by R which is calculated with the shown formula. I would like to ask you about the possibility of getting wirring diagrams from you for a certain defected electronic device. If it is within my reach I’ll surely try to help! I already have all these designs in my website, but you will have to build them separately and then integrate the stages together appropriately. I need a simple transistor circuit that short circuit, or discharge a cap, when the 12 volt power supply to a timer circuit gets turned off and when the 12 volt gets turned on to the timer circuit the simple transistor circuit must open circuit the cap again. This simple transistor circuit will act as a reset circuit for the timer when the power is switched of to the timer. https://www.homemade-circuits.com/wp-content/uploads/2018/08/timer-circuit.png This is a link to the timer that i am using. The transistor circuit must short circuit the cap between pins 3 and 6 of the ic when the power to the timer circuit is switched off and go open circuit when the power to the timer is switched on again. Or is there any other easy way to reset this timer when power goes off. 19v to 12v without current drop? what is the simple way? can i use resistors to radius voltage without current drop? 7812 will need much modifications therefore it may not be recommended. And both POT values ? 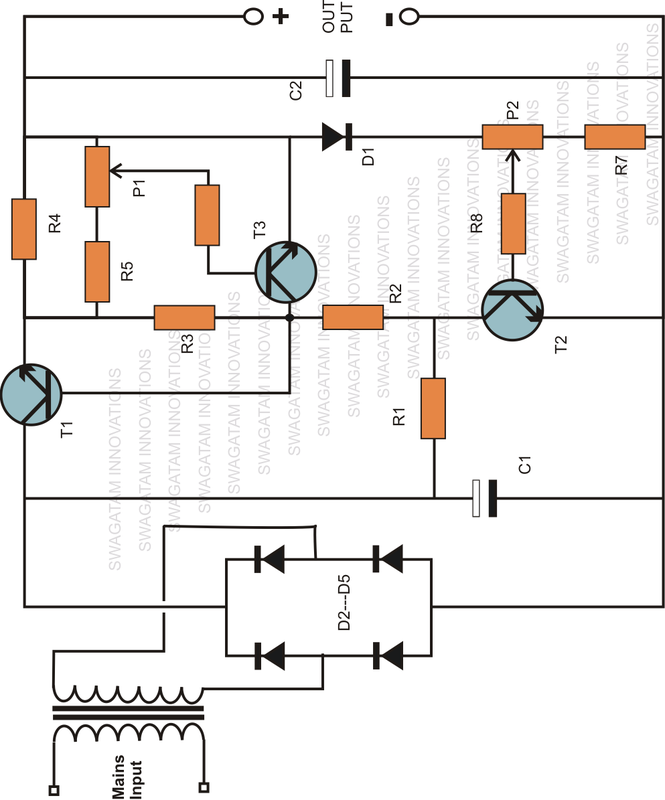 What is the value of the AC input supply in Simple Automatic Emergency Lamp Circuit? hellow sir! I am an electrical student, here in the Philippines and i know you are helpful. Im developing a device for my thesis,please help me. my problem is schematic diagram of an AUTOMATIC MIST IRRIGATION FOR MUSHROOM PRODUCTION which the objective is when it set 25 degree celcius and its attain the temperature, the irrigation will turn it ON. we are insufficient of materials here so a low cost of materials to be use sir. Im hoping for your immediate response sir because I have only less than a month free to do that thing. thank you for your anticipation. hello Riku, as per your specification the mist shower should be triggered ON when the ambient temperature exceeds 25 degrees, and trigger OFF when it reaches below this figure….I hope I have understood it correctly. Please confirm so that I can design it for you. exactly sir but it can adjust the temperature range weather the ambient temperature or depends the temperature needed to trigger ON.thank you for helping me. …but it can adjust the temperature range weather the ambient temperature or depends the temperature needed to trigger…. thank you for giving me the bright ideas sir. but there is a problem, how will i know that the temperature I set could be accurate in order to know that the device is effective. will try to update it soon…. Sir i made Simple Water Level Alarm Circuit but it not works please is ki detail bata dain k is me speaker hoga ya buzzer or kitne watt ka? just remove the relay and replace it with your load. the 100k feedback resistor can be replaced with a 1M resistor. also change the BC547 with a high current mosfet or a high power BJT as per the load specs. "actually the transformer is simply not required….you can connect the LEDs directly with the battery in parallel strings." rectify it to make it dc again and then regulate it using a 12v regulator and replace it in place of a 12v battery in a UPS. I appreciate your answer a lot. As soon as it works, I will connect the hand crank generator to a stirling engine to make it automatic, replacing manual human power with autmatic heat engine power. Next problem: How to make a high torque Stirling engine…XD…but that's out of your field of interest…so i'll take it on my own..btw…thanks again! sorry that would never work? you should have specified this before. moreover as per the diagram the trafo needs to have 220V winding at the LEd side for illuminating 40 LEDs…. A transformer rated @ 1A; 15v-0v-15v on sec. ; and 0v-110v-220v on pri.? And instead of 12v supply make it 5v dc? the supply needs to be equal to the transformer winding voltage rating, otherwise the output will be much lower, what's your battery AH specs?….actually the transformer is simply not required….you can connect the LEDs directly with the battery in parallel strings. how can you use a 9V battery to drive a 2.4V bulb?….both the voltage levels must match..
Hi, I was wanting to attempt to construct your LED light show circuit. The image says all transistors are BC547B transistors, does this include the PNP transistor that is attached to the speaker terminals? I was also wondering if I could use a 3.5 audio jack instead of the speaker terminals and any ideas on how to go about doing that? I would love to exchange emails about this if you're available. Hi, the upper input transistor is a PNP transistor, remaining all are NPN. 3.5 jack input from headphone socket will also work….the base of the PNP will need a 100 ohm resistor in order to safeguard it from peak input currents. Alternatively you can also think about the following circuit which is much reliable and accurate than the above design. My email details are given in the contact page. I Need Schematics For Incubator Timer with Hight Torque Motor ( DC Motor Power Window in Car). I am trying to get a DC motor to run in two direction until it reaches the end position then stop and switch polarity so it will run the other direction when power is reapplied. Then do the same thing at the other end. 2. motor runs in one direction until it hits stop position, say 30sec. 3. power to motor turns off when it hits stop position and delays for the 1min. timer to end/turn off main power. also reverses polarity so that. Thank you in advance for any help. This is an important home project that needs to be 100% reliable. The 1 min timer is not required since the stop switch will automatically reset the timer after 30sec…..the frequency timing between 7 to 10 is important…the timer has to initiate after this period each time the motor has finished its operations. I'll try to post it in the blog….stay tuned. Hello Sir, I would like to know how I can adapt the simple current limiting circuit using two transistors for my application. I would like to connect this circuit between my main power supply and load. My main power supply is 115Vac to 230Vac. My load is 115Vac to 230Vac at 10watts. I want this circuit to disconnect the load if the load exceeds 10watts and reconnect if the load is 10watts or bellow. Please assist me with components specifications as well as what changes will I need to make if I want to change the value at which the disconnection takes place. Kind regards. Use MJE13005 for both the transistors and calculate the values of the resistors appropriately as per the given formulas. We have this project at school and there should be a triac in it. I found your music operated dancing light circuit to be interesting. Uhm does it really work sir? Also can I change the lamps into LEDs, without getting rid of the triacs? Lastly, what is the wattage of the resistors? Hi Carmichael, yes it will work if built correctly as per the diagram…make sure to connect a 1k resistor in series with the music input capacitor at the PNP base. The circuit is not isolated from mains so is highly dangerous to touch in switched ON position. Can you please suggest me a sample-and-hold circuit for at least 10 seconds or more? mallikaraja, I'll surely include them in my blog, thanks! dear sir kindly publish some simple and useful circuits for ece department with components????? please provide an elaborate description of your requirement, I'll try to help. 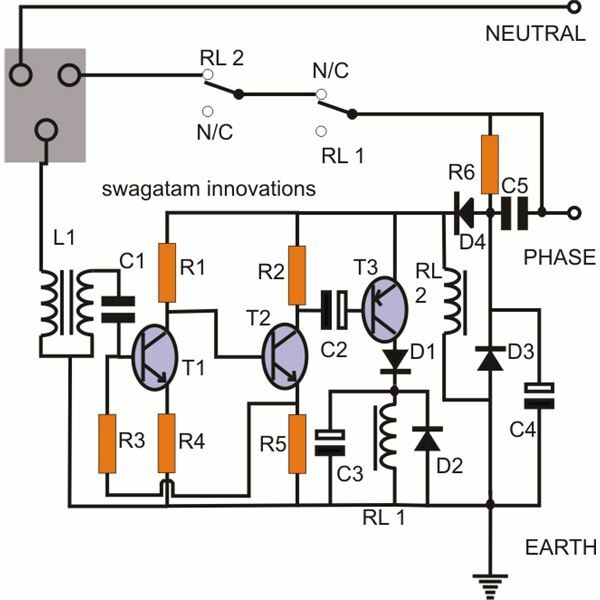 hii swagatam, i want ask about emergency lamp using Led, when we use a battery 6v 4.5ah as battery, zener 12v needed change / lower it ?? would it damage battery 6v ??? it should a little higher than the battery voltage…..so a 9V zener will be just fine. sir please im just asking do have a smoke or fire alarm? please if you have designed refer me the link thank you. The power can fed from any 12V/1amp ac/dc adapter. Hi How do I make an electronic timer cut off? eg: switch off the circuit after 3 minutes. look for 4060 simple timer circuit. In Simple Automatic Emergency Lamp Circuit, what is the value of D4 diode? In Simple Automatic Emergency Lamp Circuit, What is the value of C1 capacitor? In Simple Automatic Emergency Lamp Circuit, What is the value of T1 transistor? I want to use the current limiting circuit with a car battery, to provide fixed 5A to a load which can draw more current. Are the following values okay? By the way you can simply use a LM338 IC, it's internally set to produce maximum 5amps and will never exceed this limit. 1. Can I use 12v battery? 2. Can I use 1 watt LED? What resistor value will I use? Thanks in advanced sir!!! thanks for your answer!!! 1. Can I use 12v/7.5mAH battery? 2. And if possible, what modifications will I make? 3. How many LEDS will I use? you mean if the power source is 12v then the transformer is 12-0-12v, and if the power supply is 6v then the XMER is 6-0-6v? how about in "Simple Audio Power Amplifier Circuit"? 1. what is the transformer, 12-0-12v or 6-0-6v? 2.in 100E 5WATTS, what does "E" stands for? 3. yes it can be used. pls show me the link, because there are two emergency circuits in the above article. which circuit are referring to? Sir, what will be the wattage of resistor for 5 A maximum load current in the current control circuit ???? Will this circuit be able to handle such high load??? Hi Mohan, for which circuit? can i ve working of emergency lamp ckt ? hi I am Shadab , I think you remembered me. I have got a science congress in my school so, I was searching for non polluting batteries just like air battery, earth battery etc. Do you have any other type of battery or do you have any capacitor related project or circuit as battery. I am sorry, presently I do not have any info regarding such batteries. Remove D3, D4 and connect the battery directly to the shown position, no changes would be required. what kind of sensor are you looking for? Please provide more details about it. you are welcome Zenilyn, keep posting. R5 R6 are resistors and resistors don't have polarities. what polaritie of 0.47uf cap. They can top to R5 and R6 . Positive/ negtive.? What type of transistor T4 ,T5 PNP or NPN they can buy.,if sold out to the market transistor # TIP 127 what transistor they.? 0.47 is a non polar cap. use BD680 in place of tip1237, they a PNP transistors.